I want to share with all of you the wonderful results of a conversation I had today with Mr. Gordon Myers, Director of the NC Wildlife Resources Commission. 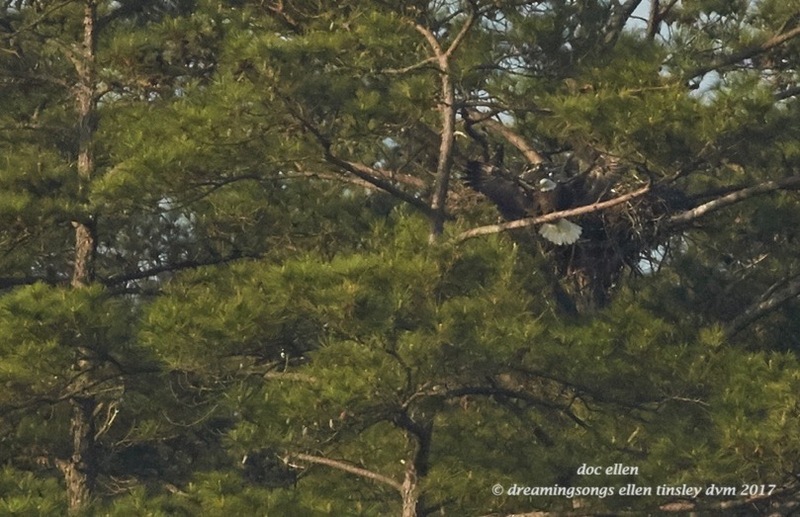 He has been thinking about not only our concerns about the bald eagles of Jordan Lake and prescribed burns, but other’s concerns about the lake’s large ecosystem. Mr. Myers felt the time had come when a study group composed of the concerned entities and citizens who love, enjoy and cherish Jordan Lake and its gamelands needed to get together. Mr. Myers asked me if I would join this group: to help start a journey toward balancing the needs of the trees and the eagles, the waters and the turtles, the forest and the deer, the meadows and butterflies. I resoundingly said yes. Mr. Myers is putting all prescribed burns in blocks with bald eagle nests on hold for more than the two weeks delay we had been asking for. He wants input from the very diverse set of interests he is asking to join the study so decisions about things like prescribed burns can be made in concert and agreement. Thank you, Mr. Myers. That is Hershey landing this morning in front of the H&G nest. Just behind his head you can see the beak of Granola. To the left and looking owlish is Raisin. Posted in birds, eagle families of Jordan Lake, Eagles of Jordan Lake, Jordan Lake, Jordan Lake State Park, photography, raptors, wild birds and tagged as American bald eagle, bald eagle, bald eagle chick, bald eagle parent, bald eagles of Jordan Lake, eagle, eagles of Jordan Lake, Jordan Lake, Jordan Lake State Park, raptor.